The Q Center’s beautiful campus was the backdrop for this exciting self contained event. As pond and water gardens professionals of every type and level of experience arrived and settled in for the next few days. Pondemonium 2015 kicked off on Day 1 with a celebration dinner for the “Top Frogs” who are the most elite of Aquascape’s customers. The “Top Frog” dinner took place at Aquascape’s headquarters Aqualand. Dinner was followed by networking, fun and music in the always popular Ed’s Beer Garden. Each day of Pondemonium 2015 began with an early morning guided walk/run for attendees who wanted to start the day with some invigoration, followed by coffee cup round table discussions featuring topics on numerous pond and water garden business subjects hosted by experts in the respective topics. Breakfast, lunch, dinner and snacks were all available daily within the Q Center. Each evening offered plenty of down time for relaxing, more informal networking, or a night cap. Day 2 featured and all-day Business Boot Camp for business owners and managers. Speakers included Aquascape CEO Greg Wittstock, Aquascape President Colleen Heitzler, Aquascape Director of Business Development Jeff Payton, Aquascape Contractor and Businessman of the Year Steve Shinholser, and Professional Business Coach Tom Reber. The boot camp topics focused on how to evaluate the different areas of your business to make necessary improvements in your operations and sales to create a healthier bottom line for your business. Day 2 also featured a hands-on training and construction principles for foremen and crew members, taught by world class designer/installers Ed Beaulieu and Brian Helfrich of Aquascape; culminating in a waterfall building competition. The day concluded with a key note address from magical motivational speaker Brad Barton. Brad is a record winning world class runner and delivered a humorous and inspirational message on grit, ending Day 2 on a high note leaving everyone smiling. Day 3 Greg Wittstock “The Pond Guy” delivered his Keynote address “Getting Better Together” to a packed house of pond industry professionals. The Pond Guy set his vision for where the industry is, where it is going, and how Aquascape will help create and drive these changes; outlining how pond professionals of every type can all get better, together. The Pond Guy’s address was powerful and inspirational, leaving the crowded house in its feet! After the keynote a day of classes began. The Certified Aquascape Contractor Philosophy given by Greg Wittstock and Ed Beaulieu. 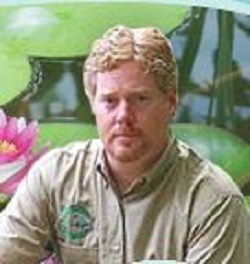 Pond Artist profiles from award winning water feature designers and Aquascape artists of the year BJ Linger, Chris Siewing, John Adams, and Jaak Harju. Running a Pond Maintenance Division with Steve Shinholser and Jeff Payton. Search Engine Optimization with Jennifer Zuri. A pond tour by bus featuring an amazing variety of water features designed and installed by the crew of Aquascape Inc. with the final stop of the tour at Aqua Terra for an evening mixer enjoying the grounds of Aqua Terra wrapped up Day 3. Day 4 of Pondemonium 2015 ended with a huge blowout bash (and pie-in-the-face fight! ), but before that was plenty more to take in during the day. The day began with a sneak peak at the exciting new pond and water garden products and innovations coming in 2016. A new format called “Deep Dive” with intimate audience Q&A with top industry experts. A visit from Dr. Pol, star of Nat Geo Wild‘s hit TV show “The Incredible Dr. Pol“. A closing keynote address from inspirational speaker Mike Powell with a strong message on relentless pursuit and having an attitude of gratitude in your daily life. And finally the Top Frog Award Ceremony recognizing the most successful pond and water garden companies in the industry; with top honors going to Conservationist of the Year Bill Renter, Artist of the Year Joey Genovese, Businessman of the Year Tom Smith, and CAC of the Year Chris Ostrander. Pondemonium delivered an amazing event again in 2015 drawing pond and water garden professionals and celebrities from around the world, who gathered for the purpose of getting better together. 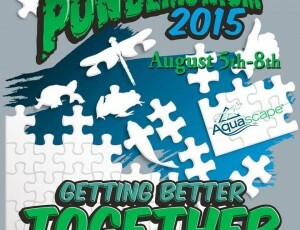 Pondemonium 2015 “Getting Better Together” was self improvement for the pond and water garden professional at the highest level. Pondemonium always delivers something to take away no matter whtat type of pond professional you are or no matter how experienced you are. Congratulations to Aquascape for another very successful event. See you all again in 2016 and let’s see how we have all improved! Go get em pond pros! Great read Mike. You hit the nail on the head. “Getting Better Together”. My crew had a blast and we are loaded with new ideas about improving our business.